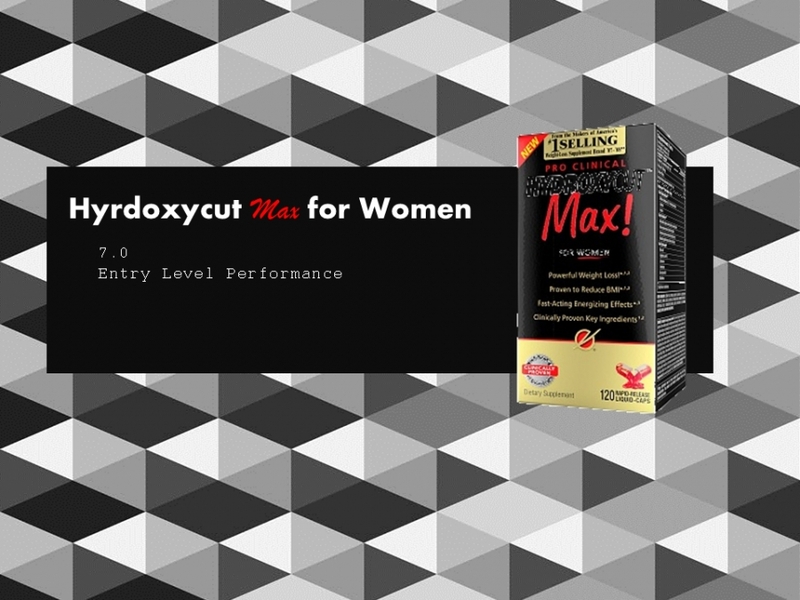 Hydroxycut Max for Women is going to be the second Hydroxycut product that I've done an in-depth review for. I had a very positive experience with Hydroxycut SX-7, which actually landed a spot in the first ever best fat burners for women list. Taking the bronze medal and being among the top products like Cellucor Super HD, Fitmiss Burn, and BSN's Hyper Shred is no small achievement. And it meant that my expectations for Pro Clinical Max for Women were quite high. To recap my SX-7 review- it basically was one of the more intense fat burners that I've ever tried. I'm not really overweight at all, but within just a few weeks I was seeing some cuts that I've never even seen before. I can attribute most of that to the formula. The seven ingredients (thus the name SX-7) in each pill were carefully selected and doesed in such a way that my body was in a constant state of ramped up fat-burning. I went into my Hyrdroxycut Max for Women review expecting similar results. But did I get them? How does this fat burner perform? Does Hydroxycut Max for Women Work? We might as well start with the million dollar question. I mean. We can talk about formulas and packaging all we want but if the product doesn't put the body into an elevated metabolic state where it can start to burn off stored body fat- then it's just not going to get a decent grade from me. I got my bottle of Hydroxycut Max randomly at Bed Bath & Beyond, which is where I got the idea for the review. Basically what happened was my friend and I were SUPER hungover, and went to the mall for some recovery. We randomly decided to get Chinese food for hungover breakfast (and by breakfast I mean like 2 PM LOL), and after eating a 3 lb plate of orange chicken, we decided to go buy new cuddly things for afternoon naps. While cruising around Bed Bath & Beyond, Hydroxycut caught my eye. Now the weird thing about this product is that I had never heard of it before that moment. I'm not saying that I've memorized the entire Hyroxycut product line or anything, but still I'm pretty in tune with the industry. Very rarely does something come along that is new or surprising to me. It wasn't until I finished my two week run with this fat burner that I came to realize just what the deal was with it. So. Let me tell you about the few weeks that I had while taking Hydroxycut. I started taking it the day after my Chinese feast, which was a Monday. As directed, I took two capsules twice a day for the first few days. I took my first dosage immediately after breakfast so that it could work in concert with the natural spike in metabolism that you get following your first meal of the day. The next doses I took before my workouts because I wanted to get the caffeinated energy benefits. The pills are relatively easy to swallow in comparison to some of the 'horse pills' that you can get. Cough Hyper Shred. After the first week I did not see too much of a difference in the way I looked. I was making an effort to do some more cardio in the gym on top of my usual weight sessions, so I was anticipating to start to see some results. Going into the second week, I upped my dosages to three pills a day, to see if that would provide the adequate dosage to start yielding results. It did not. By the end of the second week, I'm pretty sure I looked exactly the same as I did heading into the testing phase with this product. Now. I know you should typically give products a longer time-frame to kick-in. But the thing is- I've TOTALLY seen results from fat burners within a matter of days, never mind weeks. As I've said several times, I've become so in tune with my body that the I can pick up on even the smallest of changes. It's both a good, and bad thing. Believe me. With that in mind, let's go over any Hydroxycut Pro Clinical Max for Women side effects. I honestly didn't really have any side effects while taking this product. I had almost no effects of ANY kind for that matter lol. I guess if I had to name one or two, it would be that you might want to eat within twenty minutes on either side of taking this diet pill. I have a stomach of cast iron don't get me wrong, but there was one time (or two) when I took my dosage without eating, and after about 25-30 minutes, I got that feeling in the bottom of my stomach as if it was being wrung out like a wet bathing suit. Again, this might be something to do with me, or something unique to me that day in regard to what I ate (or didn't eat actually)- but just a general best practice with diet pills is to avoid taking them on an empty stomach. Ok so there aren't really any side effects. But what is in this product from an ingredient standpoint? The formula is divided into three parts: (1) Hydroxyboost (2) ProDefine (3) Hydroxagen. The 'boost' part is led off with caffeine which is no surprise to anyone. A few aminos are included in there as well. The 'ProDefine' is the fat burning piece, comprised of Lady's Mantle Extract, which I've never heard of. Mentha Longifolia is probably the best ingredient in here, but my guess would be that it is under-dosed. The Hydroxagen complex is supposed to aid in the energizing process, and includeds coenzyme q10. I'm not a huge believer in COQ10, but some people swear by it. Again, I would guess that it's under-dosed. Before we get into the final judgement, how about a quick packaging review? As usual, I'm going to have to dock this product a few points because of the packaging. The black box with red and yellow/gold trim looks like it was designed in 1982. Which was a great year don't get me wrong. But the design trends were not. Oddly enough I think my biggest problem with the packaging is the color palette. It's such a tired color scheme that I'm truly surprised that it made it off the concept board. The layout of the elements isn't all that bad. It clearly and effectively communicates the message to the consumer. I think the addition of some kind of graphic elements would have gone a long way in setting this product apart. I guess what I've basically discovered about Hydroxycut Max for Women is that it's not a product made for ME. And here's what I mean by that. Remember how I said I had NEVER heard of this product before I was poking around Bed Bath & Beyond? Well, there's a reason for that. And the reason is that the Musclepharm folks are smart. And have lots of money. And what they realized is that they have different types of customers. They have their customers like me. I spend half of my life in the gym because that's where my home is. They have lots of customers like me. And they also have lots of customers who are NOT like me. In fact they have way more customers who are not like me. That customer is not quite as dedicated to health and fitness- but they know that they want to shed a little bit of weight. That's why they made a whole different product for that person. And that's why Pro Clinical Hydroxycut Max for Women didn't work for me. It's not quite as strong a product as SX-7, and is made for a much more entry-level customer in mind. So if you are relatively new to weight-loss supplements, this product might be for you. If not, then I would recommend going with something a little stronger.